Disney On Ice presents Frozen. 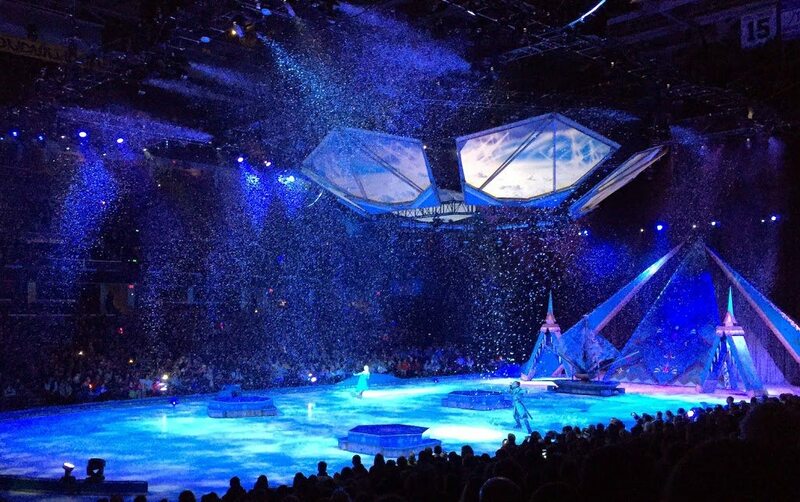 This Disney on Ice show was unlike any other we’ve seen simply because it was based on the crowd and the love everyone has for Frozen. The show itself was wonderful. I’m all impressed with how well the artists can skate and act. The costumes were amazing. I especially loved the costumes of the guests at the ball after Elsa’s coronation. The crowd went crazy when when every new character came onto the ice. The biggest reaction was for Olaf. His scenes were wonderful, of course. One of my favorites scenes was with the trolls. In order to make them their normal (very short) height their costumes have them doubled up so it looked like one was riding on the other’s shoulders. It was a great costume affect and made it look like there were hundreds of trolls on the ice. I also loved that it showed throughout the snow! They were able to control the snow so that it snowed lightly at some times and harder at others throughout the story. Here is very heavy snow towards the end of the Frozen story. What I love the most about the show was watching what thousands of little girls dressed up as Anna or Elsa singing their hearts out along with every song. You could tell they were all truly fascinated seeing their favorite characters come to life. When Mickey started the show I paused to explain to my younger son that many of these children are experiencing Disney for the first time at the show. Not everyone is lucky enough to get to go to Walt Disney World and certainly not on a regular basis. For many, this was probably their first time ever seen Mickey Mouse. You could just see the magic on the faces in the very full crowd. I would recommend Disney On Ice to any Disney fans! Click here to purchase tickets to a Disney On Ice show near you! Disclaimer: I received something of value from Feld Entertainment as part of their Insider Program. I was not required to write a positive review. The opinions I have expressed are my own.